Is there a township, or is it just Block 56, PSL Survey? Also, do you know the abstract number (formatted A-???often)? If it’s Block 56 PSL Survey, then it looks like there are active wells on your property. Are you being paid royalties? It reads, section 7, block 56, township 3, T&P survey co., abstract 880, which I have no idea what that means. And yes we have been receiving some pretty decent checks. The Railroad Commission’s website is the place to start for information. If you haven’t seen it below is RRC’s map with your section (A-880) highlighted in blue. The offers you’ve gotten were probably based on the Chimera 1-H Anadarko started producing there last May and the 2-H that they permitted in June although they haven’t filed a completion report or reported a spud date to RRC on that second one yet. RRC shows the first six months production for Chimera 1-H at 396,194 MCF and 56,304 bbls of condensate, which isn’t setting any records but will probably justify more drilling. 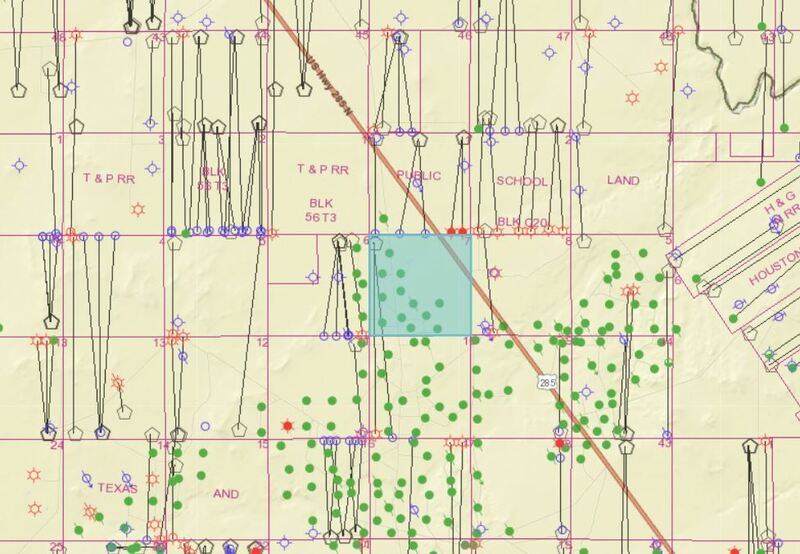 All the green dots are old vertical wells that have probably played out but may not have been plugged yet. As the map shows happening nearby, 4 to 8 wells a section is possible, and more if that area has the possibility of a second producing formation like lots of Reeves Co. Thanks for the info dusty. Is the RRC a place where I will able to find when they spud that well? And I’m assuming all those pentagons are active, horizontal wells? And with all the green dots in my section, would that mean a lot of the oil in the section is gone, or wound it mean that could be a high activity area? Solid green circles indicate currently producing oil wells. A solid green circle with a line through it indicates a plugged and abandoned oil well. A hollow blue circle is a well permit (either undrilled or being drilled, but not yet completed). These permits are active for 2 years before having to re-apply (unless drilling commences within that 2-year period). If the hollow blue circle has a line through it, that means the permit was cancelled and a well not drilled. A green circle half-filled is a shut-in well. A red circle that looks like the sun represents a gas well. Solid red is “wet gas” and hollow red is “dry gas”. These can also be plugged and abandoned or shut-in like the green oil wells. A hexagon indicates the well pad/surface location of a horizontal permit or well. The black line going from a hexagon to a circle (any type of circle) indicates the horizontal wellbore path (no black line or hexagon means the circle represents a vertical well). High activity area with multiple oil-bearing strata. Some oil gone sure, but lots left. I’ve seen sales of acreage in the same area catching upwards of $30,000 per net mineral acre, but personally wouldn’t sell something there unless I was desperate for cash. Can someone explain the whole net mineral acre,net Rolalty acre to me and how I go about calculating this info. Gross mineral acres is the tract size. Net mineral acres is how much you own in the tract. If you own 1/5 minerals out of a 100 acre tract that would be 20 net mineral acres out of 100 gross mineral acres. Personally, I don’t care for the term ‘net royalty acres’ because its confusing. Net royalty acres is based on the royalty percent in your lease (12.5% = 1 net royalty acre). So, if your 20 net mineral acres are leased at 25% it is called 40 royalty acres. So will the RRC show me daily, weekly, monthly production numbers for wells on my land? Or where could I find numbers on that kind of stuff? RRC will report monthly production. Click on an actively producing well (after initializing the “identify wells” feature from the toolbar, and then scroll down to Production Data and click on it. Then, you can adjust the time frame and number of results per page shown. Note that the RRC reports production on a “lease basis” meaning multiple wells can be represented by the entire lease production data. In other words, if there are multiple producing wells on the same lease, you won’t be able to see well-specific data, just production data as it pertains to the lease itself. So I’m revive this cause I finally found where I can see my well. Dusty can you confirm what I’m seeing. 1H well is a gas well, and 2H is a permitted well correct? No, 1H just means the first horizontal well in that unit or producing zone and 2H the second one. In some Reeves Co. units you may see 8H or higher. I’m not sure where you are seeing that but those designation could be a permitted or a completed well. It doesn’t change after the well is drilled. Well I was looking at the map, and our section has 2 hexagons on there, with lines running from them to a hollow red sun and a hollow blue circle. According to the key on the map, red sun is a gas well and the blue circle says permitted location. Also when I hover my mouse over the circles, it brings up a description saying the same. Am I reading something wrong here? Dusty, the RRC GIS map has improved as it gives more info by holding on the well, but what does the 'on schedule on/off refer to? Thanks for all your great info on this site. IOvette, you are reading it right. The map is showing in that unit that Anadarko calls the Chimera State 56-3-7 they completed the 1H well last year and got a permit approved last June to drill the 2H well. RRC isn’t showing a spud date, directional survey or completion report for the 2H so I’m assuming it hasn’t been drilled. RRC’s production report for the 1H shows it started producing last May and was reporting monthly volumes until October when Anadarko apparently shut it in for some reason. Thanks for the reply. Yeah we quit getting royalties for a coupe months, but got one this month so I guess they are back at it. So where can I find production numbers, and the info on the 2H well? And why do the lines go to a different section like that? Did they run pipe that far to hit the well? Here is the link to the latest production report for your well on the Railroad Commission’s website. February numbers haven’t been reported yet. On your question about why the well extends through the next section to the south, remember it is a horizontal well so the full length of that nearly two mile long horizontal leg is producing. The longer they can drill the lateral the lower the cost per foot to drill and the higher potential return. There won’t be anything to learn about that 2H well unless and until it gets drilled and completed. The link to the production report I was trying to send you didn’t work so I’m attaching it below. Either of those links in that earlier post should take you to the future reports on that well if you will put in District 8, Lease 282806 and the time period you want to see.